Develop a family-home safety plan and conceal carry!!! SHORELINE, WASHINGTON — A family that trains together, fights together. This is the take-away lesson after a homeowner was forced to open fire on an intruder who was smashing his windows and attempting to advance towards him. His two daughters and his wife were able to scramble and take up defensive positions in the bathroom while their father headed off the bad guy at the pass. His eldest daughter called 911. The police arrived just in time to recover the bad guy who was allegedly someone living in the same neighborhood as the family. The father had been adamant, according to KOMO News, about getting his family prepared to deal with real-life emergencies. Who knew it would pay off so well? That’s what happens when you train to work together. We have absolutely no idea what situations we’ll be faced with as a family, but it pays to have a plan and to practice that plan. This is a household that takes each other’s lives seriously. The bad guy, in this case, was screaming profanity and throwing the family’s lawn furniture through the front window and smashing glass. When he attempted to advance towards the father, the father discharged two rounds — one striking him right near the femoral artery in his thigh. The suspect lost a considerable amount of blood before police were able to apply a tourniquet to him. He was evacuated to a nearby medical facility where he is believed to survive his wounds — to hopefully stand trial. If this neighbor was a threat before or had just decided to become one out of the blue is not known. Is this the type of personality that would heed a restraining order? More importantly, if that father had not been armed and prepared to defend his family, would the assailant have shown him any mercy? These are questions that plague the mind of he who acknowledges his assailant has the right to destroy his property, smash his windows, and threaten the lives of his family. For those of us who are responsibly armed, have a home defense plan, and actively engage our family members to take roles in that plan, we will find that our chances of prevailing against the nutjobs of this world will be a bit easier. Bad guys are becoming more bold and aggressive. Understanding that valuable items and softer targets are more likely located in more affluent areas they are increasingly targeting suburban homes and neighborhoods in historically low crime areas. As with most things the sage Boy Scout motto of “Be Prepared” applies. 1. Plan it, drill it. Everyone remembers the fire drills that were practiced in elementary school. The alarm bell sounded and a swarm of generally chaotic creatures with an inclination for ignoring direction suddenly fell into line and moved to a predetermined point of safety with precise exaction. In the same vein, create a simple plan to move everyone living in your house to a pre-determined point of safety, which ideally will be room with few exit points. Only leave the security of the room you are in if other loved ones need to be secured. Everyone should know what starts the plan . . .
An alarm, a whistle, or predetermined action initiating word. Adults should plan to move to children or the elderly. Older children should move to younger ones and they should all move to a predetermined meeting point or hiding place in the room, and stay put. Panicked people tend to wander if they don’t have a highly defined place. Designating these locations will give you the ability to discriminate targets far more quickly and effectively if an assailant has made it into the kids’ rooms. Using techniques similar to those the police employ to deal with active shooters is best for the solo shooter: Don’t clear every room or move tepidly through the house. Instead, move quickly and decisively to the objective point and only engage bad guys that are an immediate threat or in the way. Understand the layout of your house and identify likely entry points/weak points. Set up a primary route and secondary route if available to get to your objective and plot out areas an invader will be likely to move through or toward. Move to the hold point and wait it out. Remain silent and listen. After sufficient time has passed, then go through the home. If anything indicates that an intruder is present, call the police and let them clear the house in a team. Better to look a little sheepish than go on a one-man house clearing suicide mission leaving your family members unprotected. When you call the police, tell them precisely where you and your family are located in the house. Tell them that you are armed, have received firearms training and that all your family members are safe and secure with you. Ask them to carefully and loudly identify themselves when entering your strongpoint. Once the plan is set, drill it multiple times. Practice. Practice. Practice. Your wife may think you’re a tin-foil-hat-wearing wack-o and the kids will think it is cool. Run through it several times, both during the day, then again at night with low light/no light. Then have an occasional surprise drill. If and when the real thing happens, you’ll be surprised to see how a standard operating procedure keeps a stressful situation a lot calmer and more coordinated. 2. Have an early warning. Police response to home alarms are notoriously slow and often set as a priority right above extracting cats from trees. Forget or even disconnect that part of it, but have a good alarm system installed set to activate instantly when a door or window is breached and use it religiously so you’ll be acutely aware of the moment someone enters your perimeter. You have the luxury of knowing who belongs inside those walls and who doesn’t. Once your alarm system is in place, the moment you hear it go off, it’s time to execute your plan. Make sure to disengage the alarm quickly so your hearing can be used to detect interior movement. 3. Prepare resources. Make sure firearms, flashlights and telephones are readily available. Waking up to an alarm, still foggy from sleep, is not the time to be fumbling with combination locks on a gun safe or scratching through your drawer looking for a light. Install quick-access gun safes next to your bed and make sure a phone and flashlight are on the night stand. Practice using them. An good alternative is a vehicle-style shotgun lock like those used by police. These can be attached to bed frames and hidden by dust covers but accessed with a hidden switch. Computer cash drawers can be purchased on eBay for peanuts and with rudimentary knowledge of electronics, wired complete with battery backup and hidden activation switch. Stash an old cell phone and charging cord in the stronghold room. Even deactivated phones can still call 911. Also, store critical first-aid supplies, such as a CAT tourniquet, quick clot agent and any prescription medicines necessary for household members. If for some reason you take a hit on the way to your secure point you’ll be able to buy yourself time. Add a few bottles of water for a short potential wait. Enter the direct dispatch number for the local law enforcement on your phone and print detailed directions to your house and to the stronghold inside the house and tuck them away in your safe room. Direct dispatch will almost always function faster than 911. For the ultra-prepared, a great innocuous cover barricade can be made by putting a full set of bookshelves, tightly packed with books, in a strategic place in your stronghold room. 4. Harden the structure. A man’s home is his castle and one of the best defenses is making your castle a more difficult target than your neighbors’. Encourage the assailant to choose the path of least resistance and go down the street. Remove shrubs and plants close to the house that make good hiding points. Better yet, replace them with thorny bushes that will discourage anyone from trying to move through them. Consider glass bricks as a relatively cheap and bombproof replacement for exterior windows in first floor bedrooms. Use quality locks and, even more important, install door jambs that will resist kicking and crowbars. As a super economical alternative, drill 1-inch holes in the floor at the foot of both sides of the door and place pieces of steel pipe in them to secure the door at night. While not exactly esthetic pleasing, the pipes can be easily removed and the holes covered by an entry mat. Make sure that entry and exits points are well lit and windows are covered to prevent people from getting a look at the valuables in your house. And get a dog- even the small ones bark when they sense an unwanted presence near or in the house. 5. Get Adequate and Applicable Training. Don’t let the first time you shoot your gun in the dark with a light be when a bad guy has just broken in. The fewer first time variables you experience in a real fight, the better off you will be. Numerous schools exist that provide valuable instruction and practice in night shooting, civilian room combat and scenario-based gunfighting skills. Often this instruction is provided by individuals with substantial combat experience. Many, including Asymmetric Solutions, use full-size ballistic house mock ups that allow the shooter to simulate tactical movement through the structure while engaging strategically placed targets. Also consider taking an intensive first aid course that will help you deal with a serious medical issue while waiting for the police to arrive and clear your house. Wilderness first aid classes designed to teach civilians how to care for major medical problems when help is at a distance are far more intensive and full of practical knowledge than the basic “call 911 and apply direct pressure” quickie basic first aid/CPR courses. Asymmetric Solutions would, of course, like to be a part of your training and offers a wide spectrum of reality-based training courses to civilians. If you don’t use us, find a solid firearms school and make sure you’re prepared. We can vouch for CSAT, TFTT, Gunsite and EAG Tactical from personal experience, but there are plenty of other good ones out there. Bottom line: making holes in paper down a shooting range lane will not – in any way – prepare you for the real fight. Reality-based training will. These steps will be met by some with the thought that, “Home invasions are rare and would never happen to me.” That, of course, is usually correct. Insurance companies are highly profitable institutions that bet on bad things not happening. Still, nearly all of us spend thousands yearly with insurance companies to prepare ourselves for those rare contingencies. We will also hear the classic “That level of preparation is paranoid.” One man’s paranoia is another man preparation until the preparation is needed. At that point paranoia is reclassified as insight. I’m not paranoid when I drive my car because I wear my seatbelt any more than my grade school principal was paranoid when he made us do fire drills. Being prepared gives you options and puts you in greater control of your situation. While home invasions are relatively unlikely, consider the value of the people and things inside your four walls. Personally, I will never let a few dollars spent on training and equipment, a little inconvenience and time spent in planning and practice and the imposition of a plan for my family be too great a cost to increase the surety of their safety and well-being. 10 Good Habits Of Concealed Carry!!! TheFireArmGuy does it again with a quick and excellent video that points out 10 good habits that every single person who carries a firearm should be doing. We’ll highlight each item below, in order, but urge you to watch the video to get all the details on each habit. Do you agree with Dan’s list? Have anything to add? Chime in with your comments below. 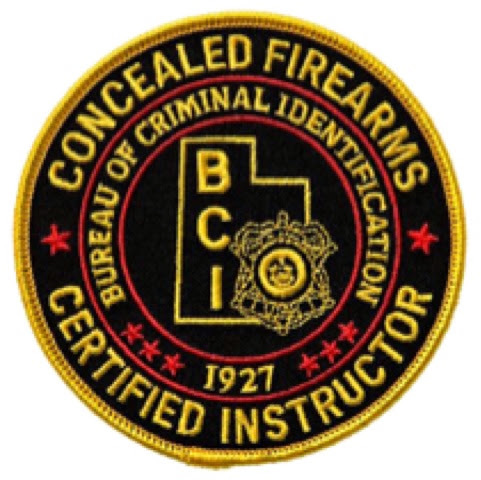 Get your Illinois Conceal Carry License... Plus get 3 other CCW's licenses FREE! (Utah CCW, Arizona CCW & Florida CCW) - together safely and legally conceal carry a handgun in over 37 States...!!! The funny thing is you’ll hear opposites from pro and anti-gun supporters. The only thing that you can look to for the truth is facts. Sometimes that constitutes jumping off the bandwagon and researching for yourself, and in this case I’ve done just that. However, don’t hesitate to look it up and back it up for yourself. This is from the Washington Examiner. The New York Times front-page editorial asserts a “gun epidemic,” which is an odd phrase, unless you think guns themselves – not deaths or shootings – are an evil. If the editors meant to refer to a gun-death epidemic or a mass shooting epidemic, here’s a relevant bit of information: Per-capita murders in the U.S. are at their lowest level since FBI records began, and they are trending downwards. The Times editors write “motives do not matter to the dead.” I would add that “weapons of choice do not matter to the dead.” So, here’s a chart of all murders in the U.S, taken from FBI data. Our Second Amendment is more vital than I think we understand, our forefathers knew that next in line of importance after the First Amendment is an amendment that allows the individual to not only protect themselves but ultimately prevent a government Tyranny. There will always be bad people, criminals and scum who victimize others to get what they want. Atrocious stories like people killing for 5$ and a cell phone, 9 year olds being lured into an alley to be shot down over a gang feud, or helpless elderly women raped and then executed mercilessly. These are people that live around you or walk by you everyday, people you can’t predict. The only thing you can predict is your own constitutional right to protect yourself, your family and others around you. The more people that understand this, the closer we get to a safer and healthier society. Criminals and scum think twice before committing a crime or victimizing others when they know there’s a pretty good chance that person will fight back and possibly shoot them. It is absolutely no surprise to us that the more people arm themselves and the more guns sales increase, the more we see murder rates plunge. Annie is attending North Idaho College for a degree in journalism and is enjoying writing about everything guns for Defend and Carry. She finds our right to bear arms imperative and can get quite spicy on the topic. In her spare time she loves reading, playing outdoors, any water activities, eating sweet treats, eating in general, playing music or spending time with her Fiance, and being surrounded by good friends, conversation and laughter. Home CCW & Firearm Training Tips!!! Nearly 100% of the people reading this article have a murder prevention tool in their home: a gun. Much like a fire extinguisher, a gun can help solve a life-threatening crisis in your home or on the street. But merely having a firearm does not make you proficient in its use any more than buying a fire extinguisher will turn you into a fire fighter. You must train with that tool if you want to use it correctly in a high-stress situation. There are many firearms training schools around the country, and quite a few of them are very good. However, many shooters find it difficult to find the money in the family budget to cover the tuition costs, while others simply don’t have enough free time to attend a multi-day class – especially one that requires travel. So, here are a few ideas that you can try to help develop your skills on the cheap. One of the most fundamental aspects of accurate shooting, and a skill that is frequently neglected by shooters, is trigger control. Poor trigger control is probably one of the most diagnosed problems in any shooter who is missing the target. No matter how steady your aim, if you are jerking the trigger, the bullet will not go where you want it to. In a violent encounter, it is critical to get rounds on target to stop the attack. Dry fire can be a simple fix to your trigger control blues. Using an unloaded gun (please triple check – mistakes can be tragic), you can practice a smooth press of the trigger repeatedly over the course of several weeks. This will help your brain and muscles build in a “habit” of correctly working the trigger. The process is simple: tape a target to the far wall of your garage or bedroom, assume a comfortable stance, align the sights and press the trigger. The best thing to do is to place a penny on the front end of the gun: if you jerk the trigger, the penny will fall. As your trigger control becomes smoother, the penny will stay in place through many trigger pulls. Spending five to ten minutes a day, for several weeks, can vastly improve your shooting. You will see it the next time you head to the range. The act of reloading won’t improve your shooting, but it can allow you to have more ammunition, and therefore more training time, for the same amount of money you are spending now. When I first started carrying a gun for a living, I bought a Dillon Square Deal progressive loader in .38 Special. I’m not sure how many thousands of rounds I cranked out using that simple, but very effective, loading machine. Although reloading can be a fun hobby, I saw ammo production as a tool to get more time on the range – and it helped do exactly that. My Smith & Wesson model 10 probably put a few tons of lead down range during the course of the nearly two years I carried it; I was shooting every week. I easily became one of the best shooters in my department, and those skills have stayed with me through the years. If you have slightly more free time than spare cash, I highly recommend reloading for your primary defensive caliber. Saving a little money for a progressive reloader, like those available from Dillon, will allow you to crank out a massive amount of ammo at a fraction of the cost buying new. There are multiple laser training systems on the market now. They allow you to dry fire a firearm and obtain instant feedback on how well you are doing. Think of it as a really advanced version of putting a penny on the end of the gun. There are several systems on the market that can help improve your shooting. The first is the SIRT from Next Level Training. The SIRT (Shot Indicating Resetting Trigger) pistols are based on the Glock design and automatically reset the trigger (no need to rack the slide). There is also a SIRT bolt replacement to train with your AR15. The SIRT system uses two lasers: the first activates when you are pressing the trigger, while the second activates only when the trigger breaks. The first laser is showing how well you are keeping the gun on target while pressing the trigger, while the second laser shows you were the round would actually go. This can help diagnose problems with anticipation and flinching. The second system is a combination laser and target system from LaserLyte. With this system, you install a specially made laser into the barrel or chamber of your firearm and dry fire at a special, battery operated target. The target will record where your shots hit. You can also use the laser without the target for the same feedback as the second laser on the SIRT. Each system offers advantages, but neither is perfect for every person. The SIRT system appears to be a more effective tool when partnering with a second person who can provide feedback to the shooter. It also allows for automatic reset of a Glock-like trigger system without the need for operating the slide. The LaserLyte is much better suited for someone practicing alone, and the laser emitters are caliber-based, allowing you to install one in virtually any gun chambered for the .380 ACP, 9mm, .40 S&W or .45 ACP. However, there are no training options for an AR or other long gun. Also, with any striker-fired pistol (Glock, Smith & Wesson M&P, etc), you will have to work the slide after every shot. The SIRT pistols start at $219 and go to $439 depending on several options. The AR bolt is $150 or $250 depending on options. The LaserLyte lasers are $87 – $109 and the target is $219. Getting quality training from a firearms instructor is the best choice for anyone seeking to improve his or her shooting. However, if time and money preclude you from getting to a professional course, using these tips can help improve your shooting without a huge investment. Get three (3) non-resident Utah, Florida & Arizona CCW permits / licenses - together legally and safely conceal carry handgun(s) in over 34 States. What does dynamic tactical combat scenario based training mean to you? How about CQB combat pistol training? If you have some vague idea involving a man wearing a black 511 polo shirt and khaki pants with his arms crossed who does lightning fast mag changes, you are not alone. If you are confused about what kind of training is right for you, or you are intimidated by the training industry as a whole, you are also not alone. Training has come to have its own language where tacticool means you are not cool and acronyms are SOP. Sometime after hitting YouTube, tactical training got an ego and became less than warm and welcoming. For newbies to firearms training this can not only be confusing and intimidating, but it can derail their quest for personal empowerment. So what does someone do after they purchase a firearm they have no idea how to use? Many have friends who teach them the “tactical ropes.” Still more take the box home and put it on a shelf to gather dust. Some take a lesson from a local guy. A few brave the ominous world of tactical training. This article is for the few and encourages the rest to join the few. The simple thing to remember is that training is just about learning concepts and developing muscle memory. Anyone who tells you otherwise is probably trying to legitimize why their courses are so expensive. Good instructors make everything very simple, because it is very simple. The finest tactical training is developed to help you function under stress while our bodies are dumping adrenaline and our brains turn to sludge. Simplicity and focus on what works for you is what you need. What you do not need is someone who is militant about whether you shoot with an Isosceles or Weaver stance. 1) If you read the course description and you have no idea what any of it means, you probably will not after the course either. 2) If it’s just too much money, then it’s just too much money, please do not mortgage the farm to learn to defend it. 3) Ask questions. Great trainers will appreciate questions and they will help you know what to expect. 4) Look for testimonials. If you can relate to the students who benefited from the course then you have a better chance of doing the same. 5) Remember you are paying trainers to provide you with tools to empower yourself. You are your own best teacher. Listen to yourself. Ultimately you are the one who decides exactly what you will get out of each training session or course you attend. 6) Look for holistic approaches to courses that give you a broad base from which to learn. If you go to highly specialized training events remember these are equipping you to react in specific ways to specific circumstances. The average defense student needs to develop a solid base set of skills before they specialize. 7) Scenario based training is how we connect the dots between putting holes in a piece of paper and tactics for dealing with real life crisis situations. It is invaluable. 8) You are doing this to preserve life, while you are at it you should be enjoying the life you are working on preserving. Good instructors negate the stress and strain of this type of training by having fun in their courses. Yes this is serious business but it doesn’t mean everyone has to wear sunglasses and a frown the whole time. You are not in the military, the goal is not to break you, the goal is to build a more confident and capable you. 9) If the instructor makes you nervous before the course even starts it will only be worse during the course. Nervous people make more mistakes and learn less. Your instructor should exude so much honest confidence that it makes you feel safe and relaxed. 10) Defense training is not ever something we master. It is something we continually practice. This is a life long journey and your only job is to relax, focus, learn and enjoy the ride! As the name implies, concealed carry is the practice of carrying a concealed weapon when outside of your private residence. The permit is essential to effective self-defense and elevates self-confidence regarding one’s ability to survive an attack. But with the ongoing gun control debate unlikely to be resolved any time soon, it appears that gun-free zones are here to stay. What this means to you is that a firearm should not be the only option in your daily carry ensemble. There are a host of alternative options that deserve consideration for backup carry and a few of the more common ones are discussed here. Collapsible batons are the modern version of the old-school nightstick. These can be an effective weapon if used properly and in the right dimensions. A baton between 12 and 21 inches is preferred — anything longer is unwieldy and a shorter baton only decreases the distance between you and your attacker. The baton can be used as an impact weapon, but may be more effective on pressure points. Pepper spray is another option that can quickly stop an attacker dead in his tracks. Pepper sprays aren’t generic; quality varies and it is important to choose your bran carefully when your life may be on the line. Sabre Red and Fox are two of the most effective brands. However, there are two important considerations about pepper spray: One, they do have expiration dates, so it’s necessary to replace as needed, and two, one in a thousand people are unaffected by pepper spray. For this reason, you should have another backup weapon readily available in the event your run into that thousandth person. That weapon could end up being a tactical pen or kubotan. These are known as force multipliers and provide additional power when striking. These devices are most effective when positioned at the bottom of the fist and used to inflict maximum pain to the throat, face, jugular, or collarbone area. While the kubotans are generally recognizable by law enforcement, tactical pens are much harder to discern and can usually be carried into most environments. Knives are probably the most common backup carry option, primarily because of their lethal potential. A good knife training course will focus on the defensive abilities of a blade and de-emphasize prolonged knife fighting. Knives are easily carried, so long as they’re not machete-sized weed whackers that will only draw attention to the carrier. The last option should also be the least attractive one. Unarmed combat techniques should only be used when all else fails. Most thugs are street savvy and probably bigger and stronger than you. So unless you are spending hours and hours each week in martial arts training, this should not be a viable option. That being said, learning a few defensive moves is not a bad idea for anyone. Is carrying two pistols better than just one? Some concealed carriers swear by it, others call it excessive. Carrying more than one handgun for personal protection has some distinct advantages and disadvantages. Do you pack more than one pistol when you head out into the world? In this article, we’re going to take a long look at the benefits and limitations of carrying a backup concealed carry handgun. No matter how ready we think we are, there’s always a lingering doubt that we’ll run into the dreaded “click” when it comes time to pull the trigger. In those situations, we can practice for action drills to remedy a misfire or failure to fire. However, some concealed carriers prefer to just jump to a second pistol. If you’re equipped for it, that’s certainly an option. PRO: Immediate follow-up to a malfunction. CON: Failure to remedy the malfunction through remedial action. Practice: It may just make more sense to practice more with the equipment you use on a daily basis so you can develop a baseline of expectation for what that pistol is capable of. If it’s not up to your standards, perhaps consider switching to a more reliable gun. This can especially be true for revolver lovers. When that first cylinder is expended in a gun fight, there’s not a whole lot of time to fumble around with a speed clip or a moon clip. Sometimes you want to be able to immediately stay in the fight. Having a secondary gun can definitely be a great boon. PRO: Staying in the fight just a bit longer. CON: It may be better just to carry spare magazines and spend more time practicing combat reloading. Practice: There’s no way of knowing how long a self defensive gun use situation will last. It may be five brief seconds or fifteen minutes. Chances are good that if the fight goes on longer than ten to fifteen minutes, you’re going to need to have the option of reloading or switching pistols. It might just make more sense to stick with the same pistol you’re using and simply reload. If you’re worried that one extra magazine isn’t enough, it’s still more expeditious to carry another magazine than carry a whole other handgun. Dire situations can make strange bedfellows. Who knows who the man or woman to your immediate left or right may be when a bad situation strikes. In a defensive gun use situation, you may feel compelled to offer aid or assistance to those nearby. Having two people equipped to handle your opponents may up your chances of surviving. Having a backup gun means you can turn one good guy into potentially two. CON: Uncertainty in tactics and training. Practice: If you’re willing to trust a complete and total stranger with one of your firearms, then you’ve made up your mind. However, if you don’t know or are not confident in that person’s abilities with a firearm (or their understanding of firearm safety), you may be creating another liability for yourself in the short term. It may be more useful to help those in your vicinity properly use cover and concealment until they can flee than surreptitiously handing out your own lifeline. In conclusion, carrying a backup handgun in either an ankle holster or a secondary holster isn’t the worst idea in the world but it may be a bit impractical in a defensive gun use situation. You’re probably better served training to reload, fix malfunctions, and practice tactical handgunnery than carrying a secondary gun you may never get the opportunity to use. There’s a lot of states that enjoy great concealed carry reciprocity across the nation and then there are states that just can’t seem to catch a break. If you’re a resident of a state that doesn’t enjoy such a great selection of travel destinations, you can always pursue a non-resident permit from a state that does. Wait times can vary dramatically and don’t expect to get an immediate response back within 7-10 business days. Don’t assume the course you may have took for your resident concealed carry permit will be acknowledged as suitable for a non-resident permit. Go to their issuing authority’s website and find out specifically what paperwork they need from you prior to signing up for any courses. In this article, we wanted to give a shout out to five states in particular that seem to have very popular non-resident concealed carry permits. Arizona — Arizona is widely considered to be a constitutional carry state. 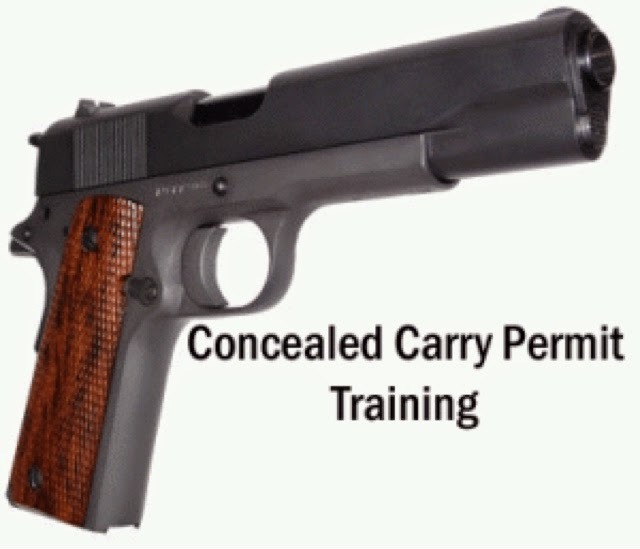 It still offers a fantastic non-resident concealed carry permit that is reciprocated in 30 states. This is a great non-resident permit to have if you enjoy traveling throughout the Southwestern states. Idaho — Even though Idaho is now considered a constitutional carry state for residents, it still enjoys a fantastic amount of reciprocity with other states through its Enhanced Non-Resident License. At present 32 states acknowledge that permit as valid and it spans states touching both coastlines and throughout the Mid-West. North Dakota — It’s a popular travel destination during the summer months and who would guess that North Dakota has one of the widest degrees of reciprocity for their non-resident concealed carry permits? At present, 34 states acknowledge North Dakota’s non-resident permit including states like Pennsylvania and Delaware that can be especially finicky about who they let carry from out-of-state. Tennessee — Tennessee offers a FANTASTIC non-resident concealed carry permit that enjoys a very wide reciprocity with other states. At present, 34 states acknowledge Tennessee’s process for determining who should carry a concealed firearm. With a Tennessee non-resident concealed carry permit, you can travel from the coast of North Carolina all the way to Seattle and only need to possibly disarm if you’re passing through Illinois, Colorado, and Oregon. This is a really great “frequent cross-country road trip” style of non-resident permit. Utah — A lot of firearms instructors offer courses marketed towards Utah’s non-resident concealed carry permit. It’s honored in 30 states but it requires a decent bit of training and background stuff. Still, because it’s offered so frequently, it’s a great deal for those interested in getting around the continental United States. Virginia — A Virginia non-resident concealed carry permit is probably one of the most easiest to obtain and has reciprocity with about 29 other states. Despite the debacle earlier in the year with the Virginia Attorney General threatening to shred its reciprocity agreements with other states, they have managed to stay true to offering a very competitive non-resident permit at a price point and commitment level many people find enjoyable. The nine millimeter round has become synonymous with self-defense handguns due to its versatility and combat viability. The only issue has been the ephemeral “stopping power” — the capacity for a combatant to be neutralized after being struck with its rounds. Now, we’ve discussed how stopping power has more to do with precision and accuracy than it does the size of the round, but when a self-defense situation arises, no one wants to mess around with wondering how many rounds it will take to stop an attacker. Now, there is a 9x20mm Browning Long but that’s not commonly used in modern firearms. All three have more than lethal capacity. A big complaint usually aired by those who look down on the 9mm cartridge family is that it’s much too light to really create much of an impact versus a .40 S&W or even a .45 ACP round. They’re not completely wrong. However, the 9mm cartridges are known for their ease of use. A much lighter recoil and smaller size makes it an ideal choice for small framed concealed carry pistols. The .380 ACP is an excellent example of a round that was widely used in first and second generation concealed carry pistols because manufacturers could fit more in a magazine. If you take a Glock 36, for instance, which is chambered in .45 ACP, it only holds about 6 rounds. That’s good enough for an emergency situation but it’s not something that would last very long in a firefight. Compare that to a Bersa Thunder .380 ACP which holds a standard 8 rounds and can hold up to 15 rounds in extended magazine versions. One is a lot easier to conceal and has many more opportunities to strike a critical hit on an adversary and the other depends on getting a neutralizing hit in the first six rounds. Granted, with a .45 ACP it’s relatively difficult to strike anything center mass and not make a deep impact whereas ballistic gel tests for a .380 ACP full metal jacket usually yield high penetration with a much smaller wound channel. But here’s the catch: that’s using a full metal jacket. We live in a world full of options and one of those options is using a highly specialized self-defense round. Frangible rounds designed to break apart upon impact or center pin hollow points designed to blow out like a mushroom once inside an opponent, self-defense rounds bring a staggering amount of damage to even smaller cartridge sizes. Do some market research for yourself and find a round that expands or breaks apart once it impacts soft tissue. This is a surefire way to keep you satisfied that if your round hits target, that assailant will be neutralized in short order. The same goes for 9x19mm Parabellum. In order to make good use of that round, you’ll best be served by experimenting with self-defense rounds that have a high velocity and the capacity to break apart or mushroom out once they’re driven into the body. If you give each bullet its very best chance to do devastating damage to an assailant, you’ll be able to appreciate the light recoil, higher magazine capacity that’s a feature of some very concealable handguns. The 12 Concealed Carry (CC) guidelines and information that follow are not meant to be boring or redundant for experienced shooters, but rather to serve as a reminder and a basic, practical Checklist to help everyone go through the critical things necessary for success in CC. Sometimes things become so routine, obvious, and acceptable to us that we, therefore, neglect them or don’t focus on them because they are so familiar. So here is a very basic Checklist to quickly go through every now and then to resurface some of these important things they we may overlook. Hope it helps with your CC and safety. Carrying a firearm brings a lot of responsibility before and accountability after a lethal shooting, so adapting the proper concealed carry (CC) mindset is extremely important. Those who carry must go out of their way to initially avoid conflict and confrontations. We must be disciplined with a controlled and mellow easy-going attitude. We know we have the gun skills and are motivated to protect ourselves and our families just in case trouble arises, rather than trying to show how good our gun skills are or to aggressively solve the world’s problems. We are not carrying a gun to protect the community and all citizens, nor to be “cool.” Accept personal responsibility for yourself and loved ones. If possible to do so safely, leave the area to avoid a deadly confrontation. This is not a sign of weakness, cowardness, or lack of skills, but rather recognition of the many varying factors that must be considered and our priority to protect our lives and those of our loved ones. The best way to “win” a gunfight is to avoid it all together. Just because we can legally carry a concealed weapon does not make us police officers nor vigilantes. We should not have a macho, emotional, impulsive, or revenge-kill instinctive reaction, but rather avoid trouble, use non-emotional and rational judgment, and de-escalate confrontations. We should make every effort to not get into fists fights when we are carrying and recognize that any time a gun is introduced into a situation, it escalates it and nothing good will result. The use of lethal force is always the last option. Being armed and prepared is more than just the possession of the firearm. The gun is only a tool. The mind is the true weapon. You must understand the reality of the situation. Your training should be comprehensive and include certain key topics, fundamentals, techniques, and safety. And they should be current and related to realistic CC situations you might actually encounter. Continued education and training in and beyond the basic fundamentals are very important. If the training you receive and the drills and repetitions you do in your practice are incorrect, outdated, and/or incomplete, you will not be properly prepared and will train the poor technique or incorrect fundamental into your subconscious memory and then rely on it in an encounter. Avoid an abbreviated, one-round fired into the barrel at a gun-show, 45-minutes, or “quickie course”. You are harming yourself (and others) by getting minimal training that often overlooks several fundamentals and techniques necessary to protect your life and your loved ones. Frequently there is minimal Range hands-on firing without personal guidance nor private, customized instruction to improve your current skill set. Also, just because 5 years ago or so you received a solid basics course, techniques and methods improve and change, so you can learn something by attending a new fundamentals course as a refresher. Recognize that just because you have had training in rifles and shotguns, there are key differences between those long guns and handguns. Annually scheduling update refresher and key topics training will better prepare you to respond automatically with the proper muscle memory. Do not neglect such topics as recognizing and solving gun malfunctions and stoppages, proper draw and presentation technique, trigger control for accuracy and speed, legal update for your state’s laws, proper use of cover and concealment, shooting on the move AND standing still, shooting with weak hand AND strong hand only, shooting multiple threats/targets, low or no light threat engagement, use of tactical flashlight, gunshot wound/trauma first aid, reloading under fire/stress, scan and access reinforcement, etc. You must know for your state or jurisdiction legally (and morally) when you can and cannot shoot, when you can use deadly force, where you can and cannot carry concealed, if brandishing and printing are permissible and/or appropriate, if you are required to show your CC license/permit when stopped routinely by a police officer, how to recognize disparate force factors, what are the details of your area’s Stand Your Ground and Castle Doctrine laws, what are your state’s reciprocity states, how to relate to the police if there is a shooting, and what to do after a shooting, etc. A lot to know, so regularly seek out current handgun laws and requirements for your state and jurisdiction from a competent source. There are many reasons for someone not to carry their gun daily, after they took the time, effort, and expense to get a concealed carry license/permit. Why do some not carry all the time and only sporadically every now and then? We should carry all the time, if we are legally-licensed to do so. I recently had some out-of-state students from states where they can’t get a permit to carry or it takes 1-2 years to do so. They wanted an out-of-state permit for when they travel and they recognize the importance of carrying all the time. Some don’t carry because there is a chance of legal problems when they transport their guns to certain places or when they travel in several states. Some live where they can carry, but work in another state where they can’t. But by far the reason for not carrying daily for some is to carry only when they are exposed to a high-threat level or feel endangered, even though we should avoid dangerous places, people, and situations. Today, ANY PLACE and ANY SITUATIONhas the potential to escalate and be dangerous, including (as we know from recent tragic events) schools, malls, churches, birthday parties, all neighborhoods, etc. Another reason I hear frequently is that it is uncomfortable to carry the gun. The holster is rubbing my side; the gun doesn’t fit right in the holster; the gun won’t fit and conceal properly under my t-shirt or with shorts; the belt won’t support it well enough; my tummy roll is a problem; etc. Duh! If the gun is too heavy, too long, too wide, has too much recoil, doesn’t fit right; or if your holster, belt, or carry method is not correct or cumbersome… CHANGE them. Some gun with you is better than the gun left at home, in the safe, or in the car. Find the best gun, holster, belt, carry rig combination that works best for yourself and carry it always. You will never know when that fateful encounter might occur; be prepared just in case. When I started carrying concealed, I was very conscious about where my gun was riding, if my shirt was properly covering it, if my pants were too tight to reveal the gun’s outline, if my fat paunch accented my gun, etc. Then, I frequently kept adjusting, touching, and checking it. I would touch it through my shirt to see if it was properly positioned and still there. I would often move it around out of habit. After some time, I realized that I was actually drawing more attention to myself and my concealed gun. I looked suspicious when I constantly tugged and adjusted my shirt. So, I calmed down, relaxed, did not touch and adjust my gun, and truly realized the value of a good holster, belt, cover garment, and proper clothing. With my horizontally-challenged build, I could no longer wear tight clothes and form-fitting, light-colored smaller t-shirts, pants, and sweaters. I had to buy my pants a size larger for in-the-waistband carry, accept a somewhat baggy appearance, and had to wear dark clothes. I got use to it and accepted that most would not even see my concealed gun and were not even looking for it. So what if they do accidentally see it. It is just my PDA, cell phone, or medical device. Naturally, it is important to train and practice with the gun and ammo you will carry. The techniques and fundamental actions that you routinely and unconsciously perform in training and practice do influence your performance in actual self-defense and combat encounters. If you are not closely familiar with your gun, holster, ammo, and other accessories, how will you be able to operate and handle them successfully, smoothly, efficiently, and accurately in an emergency encounter? So you should drill and practice regularly with your carry gun, ammo, carry garment, and equipment, so that their deployment becomes a second-nature, comfortable habit. While practicing, some shooters fail to use their hollow point (HP) or self-defense ammo they actually carry. Usually they cite the higher cost of the HP ammo. To better acquaint yourself with the performance and characteristics of your self-defense ammo, practice with it occasionally, perhaps once a month or so. You can mostly practice with your full-metal jacket ammo for cost savings, but still practice sometimes with your HP ammo. The gun you carry is going to be a compromise. You probably will realize that the gun you want to carry and the gun you will have to carry may be different. Larger guns in calibers that are generally considered to be more capable may also be more difficult to conceal and may require more practice for optimal accuracy. However, you also need to understand that concealment is usually more a matter of holster design and cover garments than gun size. It is important to use a quality-made holster from a reputable manufacturer that is designed specifically for your carry gun. Yes, you can keep your gun in a nylon holster when it’s in the range bag, but use a quality, custom-fit holster for your carry gun. A holster made for your gun model will usually allow you to draw and secure your gun better, as well as help to make it more concealable and accessible. 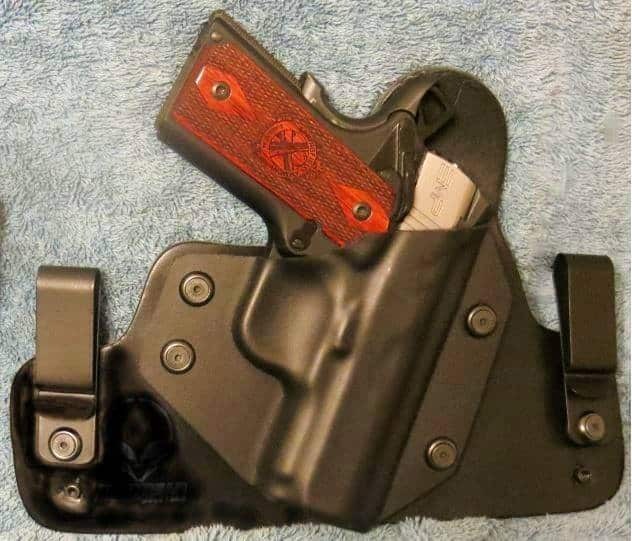 A customized holster for your specific gun model will completely cover and protect the trigger from contact with outside objects, including your trigger finger. A properly-designed holster made specifically for your gun will retain the gun until you intentionally draw it. Do not expect a $10. holster on sale for $5. to provide a reliable and comfortable carry solution for your $700 carry handgun. A very rough rule of thumb is to expect to spend about 10-15 percent of the cost of your handgun to purchase a reliable, safe, comfortable, and effective holster. Proper Inside-the-Waistband (IWB) holsters are usually more concealable, but also may be less comfortable. But they may also require a trouser and belt size adjustment to compensate for the added bulk. An Outside-the-Waistband (OWB) holster is usually more comfortable, but also usually more difficult to conceal. You can make your carry gun very concealable, but sometimes at the cost of a much slower access and draw. Or you can have a faster access and draw, but with less concealability, giving up a major tactical advantage. A very personal decision. Needless to say, a gun belt is extremely important to support your handgun. Some believe even more so than a holster. Others say at least as important as the holster. In any event, a gun belt is a “must-have” accessory for your handgun rig. You need the support for your gun and accessibility that you can count on. A rigid high-quality full-grain bull hide leather gun belt will help minimize movement of your gun, be strong and resilient for long-lasting durability, help distribute weight, and add to comfort. A leather belt that has been reinforced with an inner layer of kydex will be rigid and help it from deforming, rolling up, and sagging. Price is usually an indicator of quality, so spend the money to get a good gun belt, rather than the $15. for the discount store flimsy belt. The climate, your job, lifestyle, daily activities, and your location where you live have a significant affect on your carry clothing. In some areas, you may carry the same way all year long, while in other locations, you may wear shorts and t-shirts in the summer and heavy coats and gloves in the winter. These differences can be frustrating and challenging, but you must adapt. For example, a plain white dress shirt is usually plenty of concealment if you’ve got an inside-the-waistband holster. A loose untucked casual shirt, like a guayabera, Hawaiian or camp shirt can easily hide the grip of a handgun from the casual observer. A sweatshirt or hoodie add bulk around the waist that probably can hide most large handguns. It just depends on your gun, its size and dimensions, and your body build. I find as a horizontally-challenged geezer in my very warm Florida weather that wearing loose and baggy clothing and over-sized, untucked casual shirts make CC easier, but not so stylish. I live with it. Sometimes I switch from Outside-the-Waistband (OWB) carry to Inside-the-Waistband (IWB) carry and it seems to conceal some of my smaller guns better. Another option (so at least you will carry something) is to consider carrying one of the smaller firearms recently released, be it one of the new .380s or 9mms. Now there are many lightweight, ergonomically-rounded, reduced-snag polymer-framed pistols and revolvers made especially for carry. Of course, if you live in one of the 42 open-carry states (not Florida), you should carry with adequate retention to prevent a gun grab. With CC being legal now in all 50 states, open carry may not be your personal choice because of the negative reactions and possible problems with other folks (and maybe the police) to seeing a gun openly displayed and the disadvantage of not having your gun hidden. Of course, this is a very personal choice depending on your preferences, comfort level, and clothing choices, etc. Whether you change your method of carry for one day or the entire season, remember the importance of being familiar with your carry method. Some CC methods require you to access and get past clothing used as cover, which makes drawing more difficult and time consuming. Practice is key for you to be able to deal with your clothing as cover, draw properly, etc. in stressful encounters. Whether you know and practice Cooper’s 4 Color Codes of Awareness or Boyd’s OODA Loop, or the NRA’s Unaware-Aware-Alert-Alarm cycle, situational awareness(SA) is of critical importance for everyone at all times. We should be cautious, practice observation, scan and assess our particular environment, and know the variables at play in each situation we encounter, even though it is very difficult to do so. Briefly, SA is simply knowing what’s going on around you and knowing your surroundings. It sounds easy in principle, but in reality requires much practice and keen observation skills and focus. This is challenging in a stressful encounter or even in non-threatening environment. We tend to “behave in a way that makes sense to ourselves” and unwittingly neglect certain things. Our reality is based on our delimited set of experiences and relative knowledge. It makes “sense” to us because of particular unique experiences, controllable and uncontrollable factors, some we may not be aware of. Maybe it is because we “don’t know what we don’t know?” Research shows that when we get nervous or stressed, our attention and focus narrows, causing us to concentrate on just a few things at a time. A narrow focus can therefore cause us to miss important threats and details in our environment. While SA is taught to military personnel, law enforcement officers, and others, it is an important skill for everyone to learn as well. It takes focus and concentration with a big picture, total system perspective. In a dangerous situation, being aware of a threat even seconds before everyone else can keep you and your loved ones safe. Knowing where your external safety, magazine release, slide lock lever, and controls are located and how to operate them efficiently as if they are an appendage to your hand, might save your life because of your immediate muscle-memory reaction in a crisis. Some say it takes approximately 3,000 to 5,000 repetitions of the same action or behavior to develop and instill an automatic muscle-memory response, as a subconscious reaction to an external stimuli. Others say 8,000 to 10,000 repetitions. So practice is certainly key, like riding my bike, typing on a keyboard, playing my saxophone, or my handgun trigger control. But practice PROPER techniques and fundamentals. If a specific shooting skill or technique is at first performed wrong and subsequently allowed to continue to repeat, with the mistakes intact, then unfortunately the muscle memories created for how you complete the task will also be flawed, on a subconscious level. So when beginning to learn a new shooting skill or technique, it is best to take it slow and pay close attention to what and how you are performing the actions. This ensures that the actions being repeated represent those that are correct as opposed to incorrect. Know how to operate and use your handgun without taking time to think about it. Develop the muscle memory. I know in certain strict training environments, some Range Safety Officers (RSO) will not let students clear their own malfunctions and stoppages and require them to raise their hand so the RSO can safely resolve the problem. Sadly, I know of a case where an officer experienced a stoppage problem in the field because they had to think whether they should go ahead and clear the jam themselves. That precious use of time was their downfall. Also, some law enforcement officers have been killed in the line of duty because of their lack of familiarity with their handgun and certain magnum ammo rounds and recoil. In one case (in the unincorporated area of Los Angeles – the Newhall Massacre of 1970), four California officers had practiced almost solely with lesser-caliber and lesser-recoil ammo, so they were not as accurate when they used the duty magnum rounds and were, sadly, killed in less than 5 minutes. Thoroughly know you CC gun and ammo. Take time to regularly practice with your CC gun and use your personal-protection (e.g. Hollow Point) ammo to practice with occasionally. Also, regularly maintain and clean your CC gun. Honestly, I clean my gun after EVERY use, even if only shooting a box of 50 rounds. This may be an overkill for some, but I have the peace of mind of knowing my CC gun is always in a top state of readiness and will not let me down because of a cleaning or maintenance issue. I believe that at least monthly you should inspect, function check, clean and maintain your concealed carry gun. Begin your CC training by analyzing your present skills and where you need improvement. It is imperative to build positive and useful training and practice habits early. I believe shooters should review their training process and topics on an annual basis and constantly, then design your practice plan with specific drills to help improve certain identified skills or areas needing improvement. There is always something to learn or improve upon. Shooting fundamentals and skills are perishable and they deteriorate if not practiced. So, you must practice on a regular basis. Every year I try to complete at least one course for improvement. Practice is critical, but so is how you practice. Do not just shoot holes in paper, but have a planned course of fire and specific drills to focus on key fundamentals and areas where you need improvement. Snap Caps and dry firing can be very helpful. Snap capshave a spring-damped false primer or one of plastic that cushions and protects the firing pin for many repeated strikes and protects your gun’s components. Dry firing is practicing at home with snap caps and an UNLOADED gun. If you cannot get to the range regularly, then use (inert) snap caps to practice in the comfort of your home. You can practice aiming, sight alignment, stance, grip, trigger control, loading and unloading, clearing malfunctions, and drawing to build muscle memory. Recognize that while dry-fire practice drills with snap caps are useful, there is no substitute for live fire. If you cannot devote some time on a regular basis to shooting practice, your shooting skills and performance under the stress of a deadly-force encounter will suffer. Regular live-fire practice definitely helps. Try to plan for a monthly Range shooting session, but go at least every 7 to 8 weeks as a minimum. You can practice dry firing as a supplement in your home once a week. Be prepared, since violent encounters occur at what seems like the speed of light. This personal opinion article is meant for general information & educational purposes only and the author strongly recommends that you seek counsel from an attorney in your state or jurisdiction for legal advice and your own personal certified weapons trainer for proper guidance about shooting & using YOUR firearms, self-defense, stand your ground law, and concealed carry. This is not legal advice and not legal opinions. It should not be relied upon as accurate for all shooters & the author assumes no responsibility for anyone’s use of the information and shall not be liable for any improper or incorrect use of the information or any damages or injuries incurred whatsoever. Safety First! Common Ballistic Terms You Should Know!